Key Fishing or Letterplate Fishing is a technique burglars use to get hold of keys, purse, handbags and more without even having to enter a property! They simply push open the letterbox flaps and use a long hooked rod, similar to a fishing rod, to ´fish´ for keys and handbags. Meaning they can then use the keys to just walk into a property and help themselves to anything they want before driving off in the homeowner’s car! That is why the MAX6 Letterplate Restrictor Shrouds are perfect to stop hands getting through the letterbox and either hooking keys or opening the lock. The MAX6 Security Mail Bags are developed to ensure easier retrieval of post, improve home security by preventing manipulation of the door lockthrough the post opening and also draft proofing the home. The extra strong sliding door chain consists of 3 parts: The chain, the holder and the receiving plate (with the long cut out in its centre). Fixing screws are also supplied in the pack. 1- The chain and holder are to be fixed to the side of the doorframe. You should put the chain at a height that suits you. 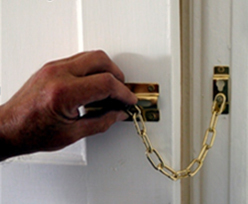 We would recommend fitting the door chain around waist height, so you do not have to bend down when using it. 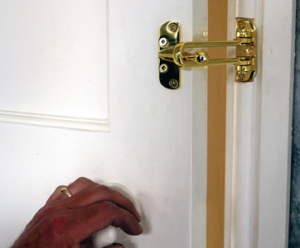 2- Use the fixing screws to securely fix the chain holder to the door frame. NB: If fixing into a wooden frame then you may find it slightly easier to make a small pilot hole first. If fixing into plastic do not make a pilot hole. You can make an indent to start the screws grabbing. 3- Once done, line the receiver plate with the edge of the door and in line with the holding plate. The circular cut in the receiver plate is to be nearest the centre of the door. 4- Fix the receiver plate using the remaining screws and the same procedure as above. On the end of the door chain you will find a plug. The narrow point of this goes into the slot in the receiving plate. Make sure the chain fits correctly and slides easily. When someone approaches your door, put the plug into the sliding plate and slide the plug to the edge of the door. This will enable you to open the door a few inches to see who is at the door. Your door chain should give you years of trouble free use. However, once a year clean the chain with a mild soap solution diluted in water. Dry off the chain with a lint free cloth. MAX6MUM SECURITY extra strong sliding door chain improves your overall door security! Crime rates are gradually rising in the UK and criminals are getting more and more creative. They pose as postmen, charity workers or simply someone looking for directions, and once you open your door to them they can easily push their way through. Situations like this never end well and usually someone gets hurt. You can prevent it by installing this very simple device! Unlike other chains that break at the slightest strain, what makes the extra strong high security polished brass sliding door chain from MAX6MUM SECURITY the ideal choice for your front door is that the door security chain is entirely made of steel, and each link is individually soldered and welded, providing additional strength and resilience to forced entry. This innovative design and quality means that the door chain can withstand over 100kg of breaking force! 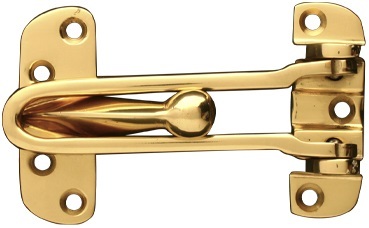 Fitting a high quality polished brass sliding door chain is ideal for the elderly as they are generally most targeted by intruders of this kind. In addition, if you have small children the chain can double as keeping young children from leaving the home unnoticed through an easy to open door, all the while protecting them should they reach the door before you and open it to a stranger! Each sturdy MAX6MUM SECURITY door chain comes with all necessary parts and fitting screws, and easy to follow step by step instructions so you will be able to install the door chain yourself without the help from a 3rd party! To compliment the Sliding Door Chains, we have also developed hollow wall anchors. Hollow wall anchors are used to fix the screws into the plastic door frame to get a good, solid fix. The reason these are needed is because a door frame maybe 2mm thick, so there is not enough material for the screws to grip. 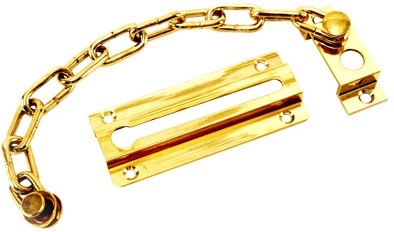 These are especially needed when fixing many products such as door chains etc. into think skins of uPVC panels or composite door skins. The extra strong high security door chain consists of 3 parts: The chain, the holder and the receiving plate (with the cut out in its centre). Fixing screws are also supplied in the pack. 1- The chain and holder are to be fixed to the side of the doorframe. You should put the chain at a height that suits you. We would recommend fitting the chain around waist height, so you do not have to bend down when using it. 2- Use the fixing screws to securely fix the chain holder to the door frame. The holder should be pointing upwards with the door chain ring fixed into the indentation. NB: If fixing into wooden frame then you may find it slightly easier to make a small pilot hole first. If fixing into plastic do not make a pilot hole. You can make an indent to start the screws grabbing. 3- Line the receiver plate with the edge of the door and the holding plate. The cut in the holding plate is to be facing the edge of the door. In the middle of the door chain you will find a flat plate. The flat plate goes into the slot in the receiving plate. Make sure the chain fits correctly and slides easily. When someone approaches your door, put the flat plate into the receiving plate. This will enable you to open the door a few inches to see who is at the door. MAX6MUM SECURITY extra strong narrow door chain improves your overall door security! 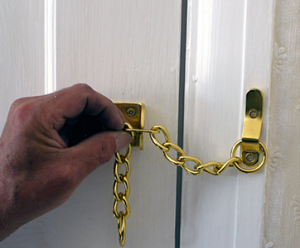 Unlike other chains that break at the slightest strain, what makes the extra strong high security polished brass narrow door chain from MAX6MUM SECURITY the ideal choice for your front door is that the door chain is entirely made of steel, and each link is individually soldered and welded, providing additional strength and resilience to forced entry. 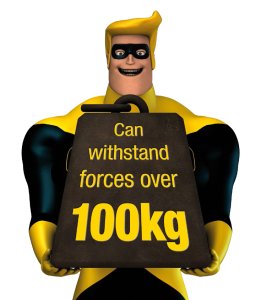 This innovative design and quality means that the door chain can withstand over 100kg of breaking force! To compliment the Narrow Door Chains, we have also developed hollow wall anchors. Hollow wall anchors are used to fix the screws into the plastic door frame to get a good, solid fix. The reason these are needed is because a door frame maybe 2mm thick, so there is not enough material for the screws to grip. These are especially needed when fixing many products such as door chains etc. into think skins of uPVC panels or composite door skins. The extra strong door guard consists of 2 parts: the moving arm guard and the receiving plate. Fixing screws are also supplied in the pack. 1- The moving arm guard is to be fixed to the side of the doorframe. You should put the guard at a height that suits you. We would recommend fitting the restrictor around waist height, so you do not have to bend down when using it. 2- Use the fixing screws to securely fix the door guard to the to the door frame with the moving arm positioned to cover the door. 3- Once done, line the receiver plate with the moving arm plate so that the ball fits into the middle of the wider gap at the end of the moving arm. This is the point where the moving arm pivots. Fold the moving arm across the door so it is flat with the door. At this point the ball in the receiver plate will be about central at the end of the moving arm. Use your door guard at all times when you want security in your property. Simply fold the moving arm across the door. If you want to open the door fully then lift the moving arm. Your door guard should give you years of trouble free use. However, once a year clean the door guard with a mild soap solution diluted in water. Dry off with a lint free cloth. Safely restrict the opening of your door with the MAX6 Extra Strong Door Guard to identify and communicate with unknown visitors and deter forced entry! The door guards consists of two parts; the moving arm and the receiving plate, and comes with fixing screws. 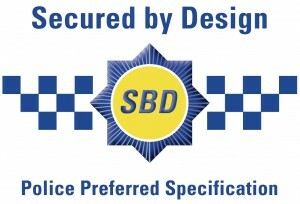 The door guards are very easy to fit and use, and will fit onto any door. To compliment the Door Guards, we have also developed hollow wall anchors. Hollow wall anchors are used to fix the screws into the plastic door frame to get a good, solid fix. The reason these are needed is because a door frame maybe 2mm thick, so there is not enough material for the screws to grip. These are especially needed when fixing many products such as door chains etc. into think skins of uPVC panels or composite door skins. At MAX6we are constantly striving to improve on the products we already supply as well as develop new, pioneering ranges and practical product solutions. The Rack Bolt Set consists of 4 parts; the Rack Bolt, the Key, various Locking Plates and various Escutcheons. We have also supplied fixing screws. To fit the rack bolt, you will need a tape measure, pencil, drill, 13mm & 16mm wood bits and a chisel. 1. Use a pencil to mark the centre of the side of the door where you want to put the bolt. We recommended 150mm from the top or 200mm from the bottom of the door. 2. Using a flat bit, drill a hole to the length of the bolt (approx. 16mm wide by 60mm long). 3. Slide the bolt into the hole and use a pencil to mark around the bolt plate. Remove the bolt and chisel out a recess for the plate so it sits flush within the door. 4. Mark the position of the keyhole on the inside of the door with a pencil by aligning the edge of the bolt with the plate recess. Drill a hole slightly larger than the key through half the door thickness. DO NOT DRILL ALL THE WAY THROUGH! 5. Position the bolt into the door and drill the fixing screws into the bolt plate to hold it in place. 6. Position your chosen escutcheon over the keyhole and drill in the fixing screws to hold it in place. Insert the key and check that the bolt is moving in and out. 7. To create a bolt hole, close the door and operate the rack bolt to leave a mark on the door frame. This will show where the bolt hole needs to be. Use the drill to create a hole slightly larger than the bolt into the door frame. Operate the rack bolt to ensure the bolt hole is in the correct position. 8. Position the locking plate over the bolt hole. Draw around the locking plate then chisel out a recess similar to before. When you are happy with the position, screw it into place. The MAX6 Rack Bolt Set can be installed anywhere on a door, but usually most prefer it either at the top or on the top side of the door. This makes it an ideal safety precaution if your customers have small children in the house and you want to protect them from leaving the home undetected. The high quality rack bolt has been tested for over 500,000 cycles and ensure longevity and added security to a front door. The MAX6 Rack Bolt Set comes with all fitting screws, two rack bolts, a rack bolt key and a full set of oval and rectangle escutcheon plates in white, polished brass and polished chrome, to ensure that it matches your door hardware perfectly. The rack bolts have surpassed BS EN 12051 standards for durability, fire resistance and corrosion resistance, and can be fitted to any wooden or composite door. Installation consists of drilling three holes, one for the bolt hole, one for the key hole, and one for the bolt recess. Fitting the face plates and keyhole plate is fast and easy. 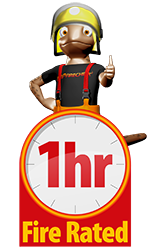 Each Rack Bolt Set comes with a 2 year guarantee and ensures highest quality and longevity.